Most of the teams taking part at the test in Jerez were simply doing shakedown mileage in order to ascertain if their powertrain integration and systems were operating as expected. Ferrari however were conducting aero testing, back to backing components and establishing if the results seen in CFD and the Wind Tunnel correlated with the real world data. This has been an issue for the team over the last few seasons and led to the team using Toyota's facilities in Cologne whilst a refit of their own Wind Tunnel in Maranello took place. The extraction of downforce from the Diffuser at the start of this season will undoubtedly be much more difficult, the last few seasons has seen teams utilising exhaust blowing to 'Seal' the sides of the Diffuser. This loss of exhaust blowing means the rear of the car becomes more sensitive, due to the oscillation of the rear tyres outbound of it and causes what we call 'Tyre Squirt'. Tyre Squirt is airflow that is laterally pushed into the diffusers path and upsets the natural flow structure, teams will try to mitigate this disadvantage by redesigning the way in which airflow is presented to the Diffuser. 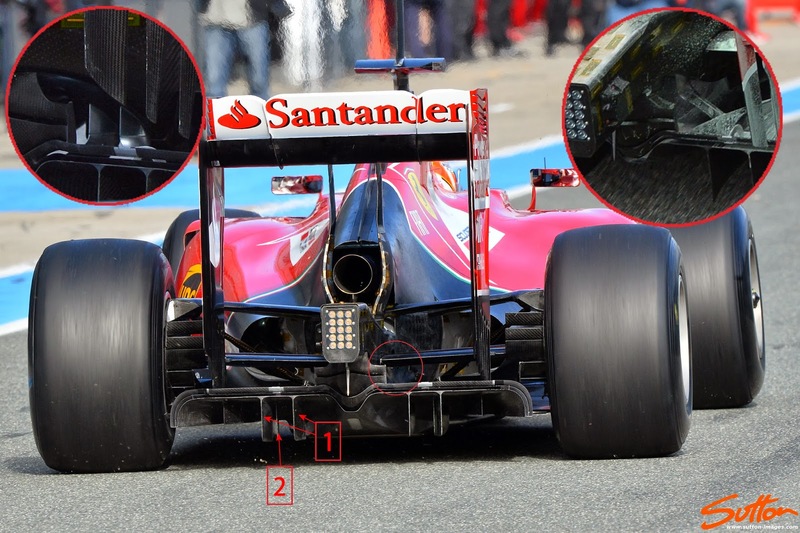 With this in mind Ferrari trialled two different Diffuser layouts at the Jerez test. The Diffuser used by Ferrari initially seems outwardly more complex and relies on airflow above the floor of the car making it's way into the central section of the car (under the crash structure). A curved central outlet allows airflow to move under the crash structure which has been further carved out (right inset) and upwardly pull on the airflow from the Diffuser (Upwash). Two doglegged blades mounted under the crash structure frame the section of the floor that has been carved/scalloped out to isolate the centralised flow (left inset). Furthermore the Y100 (200mm) slotted element surrounding the crash structure looks to work with this flow and create an airflow structure upstream of it. A pair of tall flush mounted Vertical Floor Strakes can be seen either side of the sloping centre section of the Diffuser  whilst another tall Strake placed further back and skewed in it's orientation is mounted inside these. Two much shorter Strakes are placed outbound and are orientated toward the periphery of the Diffuser. The Strakes purpose is to both align the airflow coming through the Diffuser and create Vortices that will join up with the flow regimes above. Each Diffuser design will be sensitive in a different way with the one tried later in the test sporting a central section without the curved upper Y100 outlet. Furthermore the more central Vertical Strakes are outwardly graduated following the angle of the Diffusers surface. Whilst outbound of this we find the same quantity of Strakes but all following different height and orientations to interact with the altered flow structure. We find a full length perforated Gurney Trim around the periphery of both Diffusers with only the central section changed to suit the aforementioned Y100 changes. 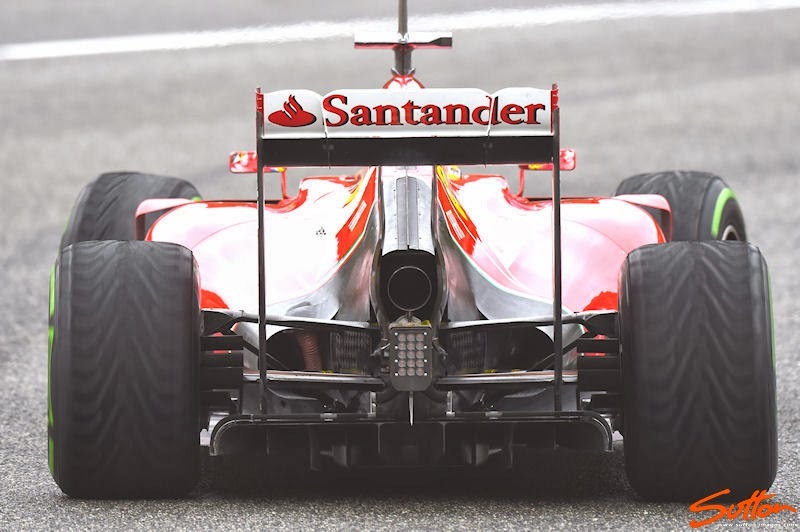 Does the second diffuser also had the two doglegged blades mounted under the crash structure?